We’re now officially in the final throes of a very bad case of election fever. Or at least the wonks are. The latest and probably last crop of major polls is in. Moreover, last Sunday brought us the Bavarian Land (i.e. State) election, which was obviously seen not as an election in its own right but rather as a Bellwether for the big one. This is nonsense. What’s the Matter with Bavaria? Last Sunday, the Bavarian Christian Democrats received a cool 47.7 per cent of the valid votes. That is enough to give them a majority of the seats in parliament. The Liberals, with whom they governed from 2008, are no longer required and, to add insult to actually injury, actually no longer represented in parliament, as they got a not-so-cool 3.3 per cent. Just a week before the national election, journalists, politicians and pundits are desperate for every shred of insight into what’s to come, and so the idea of a Grand (CDU/SPD) Coalition gained a lot of currency very quickly. Predictably, the FDP launched a new plea for “loan votes” from CDU supporters. Slightly less predictably, the CDU declared that they had no votes to spare, and that their supporters should vote straight. But the Bavarian election is not very informative. Bavarians made a judgement on a different government, voted for different parliament, under different rules and facing a different party system. Merkel’s CDU does not even exist in Bavaria, which has its own Christian Democratic party, the Bavaria-centric CSU. Both parties do not even form an electoral alliance for the Bundestag election. They have merely chosen to co-operate in parliament for the last 17 times (and will do so again). In a very real sense, the current coalition consists of three parties, and the CSU has often been the most quarrelsome of them. The CSU is the party of Bavarian nationalism, and single-party rule by the CSU is more or less the norm. The CSU has been part of every post-war government with the exception of the 1954-57 gang-of-four coalition (an abomination), and has governed alone from 1947-50 and then again from 1966-2008. A liberal presence in the Bavarian parliament, on the other hand, is not the norm. The party was out from 1982 to 1990, and then from 1994 to 2008. The Greens have been doing better than the Liberals in every election since 1982, and that is saying something in Bavaria. And yet, there is a whiff of change in the air. In Germany, the two major public TV channels are the main sponsors for frequent large-scale polling. In the past, they stopped publishing results ten days before the election, but this is not a legal requirement: The law only bans the publication of findings from exit polls before the polling stations close on Sunday at six. Publishing results based on interviews conducted just before voters entered the polling station would be technically legal. This year, broadcaster ZDF broke with tradition and published their final poll yesterday. Moreover, findings from three other major polls were published today, bringing the total of new polls since my last post to five. Two of them are straddling the allegedly ominous Bavarian election, while three of them were conducted this week. What do they tell us? 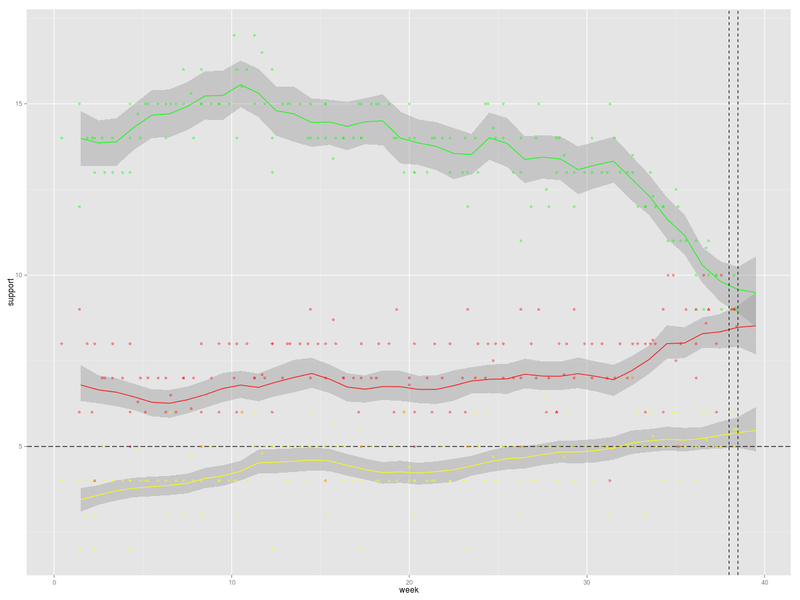 This close to the election, the model is becoming a lot more confident, i.e. credibility intervals for Sunday are now pretty narrow. The upward trend for the SPD (Fingergate notwithstanding) and the corresponding downward trend for the CDU that became visible last week are now more pronounced, but this should be seen in proportion: Predictions for both parties are within a point or two where they were seven weeks ago. Things look a bit different for the smaller parties. The Greens are now projected to garner just under 10 per cent. In early August, the model was giving them about 13 per cent (with a very wide credibility interval). Looking at the curves, one can be pretty certain that there has been real movement: They have lost about one quarter of the support they had in mid-August. Conversely, the lot of the Left has improved. They are now projected to end up with about eight per cent, up from roughly six per cent that were predicted in August. The most interesting case is of course the FDP. Back in August, the model thought they would scrape by with about five point something per cent. The probability that they would enter parliament at all was estimated at roughly 70 per cent. 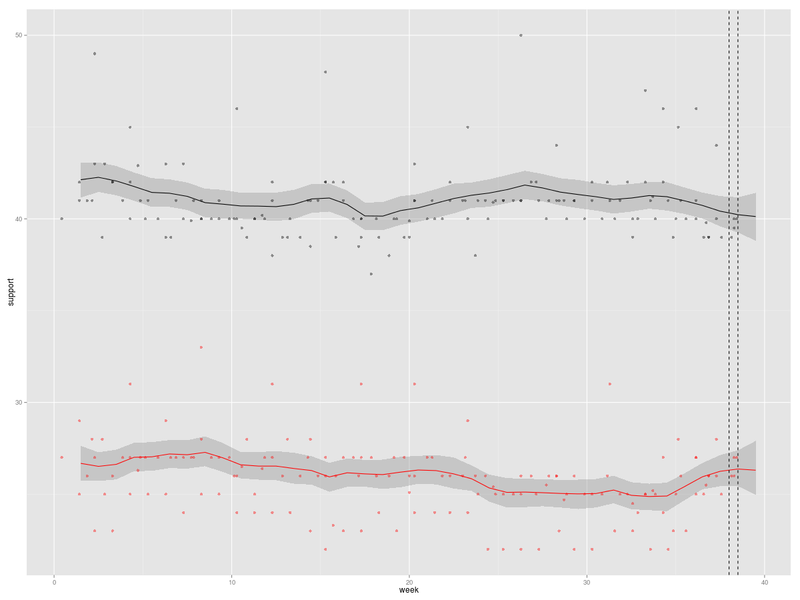 Seven weeks on, the estimate for their vote share has hardly changed, but the credibility interval is much more narrow. The model is now 95 per cent certain that they will garner at least five per cent. Reports of their death seem slightly exaggerated. Or my model could be totally wrong. The probability of a majority for the current coalition is now estimated at 82 per cent. Whether the CDU likes it or not, voters will not ask for permission to vote tactically. If they do, the probability goes up to 85 per cent. These figures are down by seven/nine points from last week, reflecting the (modest) decline of the CDU and the slightly better performance of the SPD and the Left. But the probability of a Red-Green government is still zero per cent. The probability of a (politically infeasible) Red-Red-Green majority is 15/18 per cent (lower if CDU supporters help the FDP). In line with previous post, I assume that there is a one in ten chance that the SPD might go back on their word, and a nine in ten chance that they would form a Grand Coalition with the CDU. This puts the Merkel-O-Meter (TM) at 98 per cent (irrespective of tactical voting). Finally, the AfD is still making an awful lot of noise. While their party leader has recently lost a libel suit against a leading pollster, their supporters in the social media tend to say things that would make you want to avoid them in dark alleys. So far, one single poll has put them at exactly five per cent, and that was based on an online access panel. Everyone else has them at four per cent or less. If 40 per cent of the current support for “other” parties is for them, their probability of getting into parliament is zero. If their share of the “other” vote was more like 60 per cent, they would be almost certainly in. While the pundits’ and politicians seem to brace themselves for a Grand Coalition and the death bell is ringing for the FDP, the model says that a new mandate for the current coalition is still by far the most likely outcome. That feels distinctly odd. German politicians have a mantra that goes “Polls are not actually election results”, and pollster routinely claim that they are not making predictions. But colleague Bernhard Weßels over at the WZB has an excellent blog about the fit between polls and election results (in German). Usually they are very close. But there are some embarrassing exceptions. So stay tuned for post-election analysis, subterfuge and model tweaking. Sehr interessant, auch der Verweis auf Weßels. Allerdings sind beim ihm die Abweichungen bei der CDU recht groß, was ich als Manko eines Modells ansehen würde, welches ausschließlich auf Umfragen basiert. 2. Berücksichtigung des geplanten Splitting-Verhaltens aus Umfragen (klar, diese Daten werden von den Instituten nicht veröffentlicht. Vielleicht könnte man es aber mit GLES-Daten prüfen. Aber auch so schon toll!